Review | At school, did you have a genius in your class who excelled in everything? Not only did he outshine everyone in English and maths but even in PE. The car industry also has such a genius of its own: Toyota. This little fellow now shows his talents in the executive field with the brand new Avensis. Toyota excels in everything. The Toyota Aygo is one of the best sold small cars. The Land Cruiser has achieved an almost legendary status as a 4x4. The Prius is the icon of driving environmentally friendly. These cars do not distinguish themselves on a certain aspects. They offer whatever the competition offers and go that extra mile on all aspects leaving the competition behind. 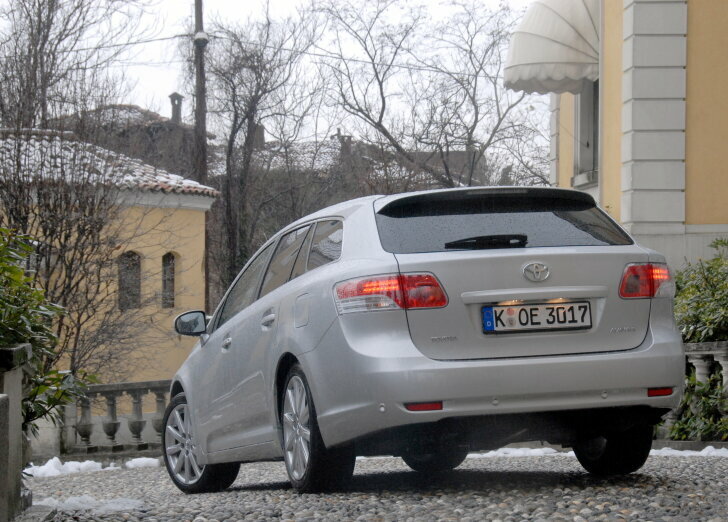 This was also the starting point when designing the new Avensis. The head of the design team, Takashi Yamamoto, personally drove 3,000 miles through Europe in order to familiarise himself with the European roads and European traffic. This has resulted in a remarkable firm steering car. The Avensis steers pleasantly heavy and is very responsive for such a luxurious car: just the way European drivers like it. Its road-holding is almost sports car like. Whether through fast corners or in case of an abrupt steering correction, the Avensis continues to follow its course with uncanny precision. On the motorway the Avensis has exceptional linear response and self-centreing, allowing to cover long distances with ease. Considering the fact that the Avensis performed this well in the pouring rain with zero temperatures, it is clear that its road-holding is simply excellent. Yet the Avensis is not perfect. 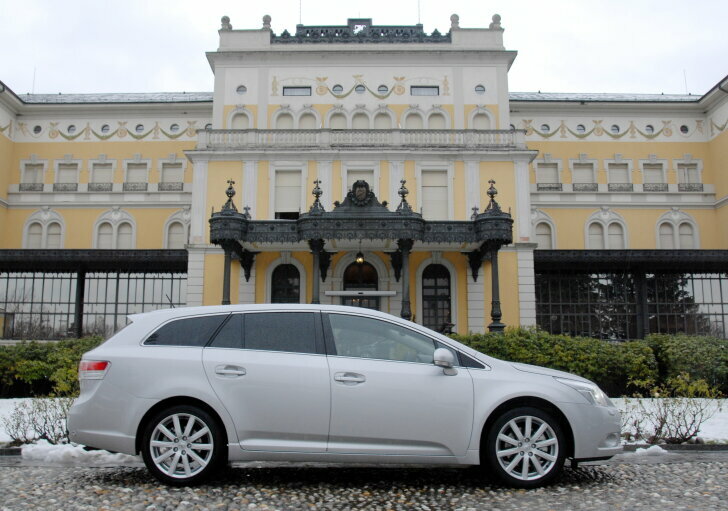 Despite its superb stability it is clearly noticeable that the Avensis is a large, heavy car. Therefore, its steering is precise yet this is by far a lively, dynamic driver's car. In particular in case of an emergency stop it is noticeable that the braking distance of the Avensis is very long due to its weight. These days virtually all makes supply engines that combine excellent performance with a consumption that used to be considered unprecedented low. Yet Toyota takes things one step further. For this test a 2.2 litre D-4D four-cylinder diesel was driven delivering 150 hp / 340 Nm. The performances of this beacon of power are excellent. If required the Avensis D4-D can simply be fiery. It has no problem with rapid overtaking, swift joining in and covering long distances at a murderous pace. For example: at 100 mph the rev counter indicates just 2,500 rpm! In addition the engine noise is barely noticeable and therefore all that can be heard are the rolling sounds of the tires. For those who keep to the speed limits and promptly follow the advises of the shift indicator, this bruiser can achieve an average consumption of 6.3 litres of diesel per 60 miles. This is slightly more economical than comparable engines of its rivals. Nevertheless, Toyota's promise as to a consumption of 5.6 litre per 60 miles is hard to achieve and is only feasible when the speed does not ever exceed the 60 mph. The sports car feel as mentioned earlier is also owed to the seating position. The Avensis has a slightly lower seat than average. The front screen is slightly flattened and the A-pillars (piece of metal between front screen and front door) have been placed further forward. Unfortunately it has a drawback in that the A-pillars reduce visibility which is interfering, in particular when in busy urban traffic. The space at the front is ample, with remarkable room to move around the front seats. The optional panoramic roof enhances the overall feeling of space, but this construction goes at the expense of headroom. The rear seat space is below average considering the size of the car. When it comes to its kit, the Avensis literally offers all the luxury and safety provisions that competitors also have at their disposal. This also includes things that up to now were solely reserved to Toyota's own gallery of honour: Lexus. The Avensis is capable of carrying out minor steering corrections should the driver accidentally (read: without indicating) cross an uninterrupted line. Should a steering correction be required in order to escape from a skid then steering in the right direction is made easier to help the driver. The Avensis can optionally be equipped with a combined audio, communication and navigation system. Unfortunately the navigation system contains outdated software and worked poorly during a test drive in Northern Italy; entire motorways have not yet been mapped. On the other hand, the so-called "Premium audio system" is of exceptional quality. Its sound is crystal clear, well- balanced and very refined. 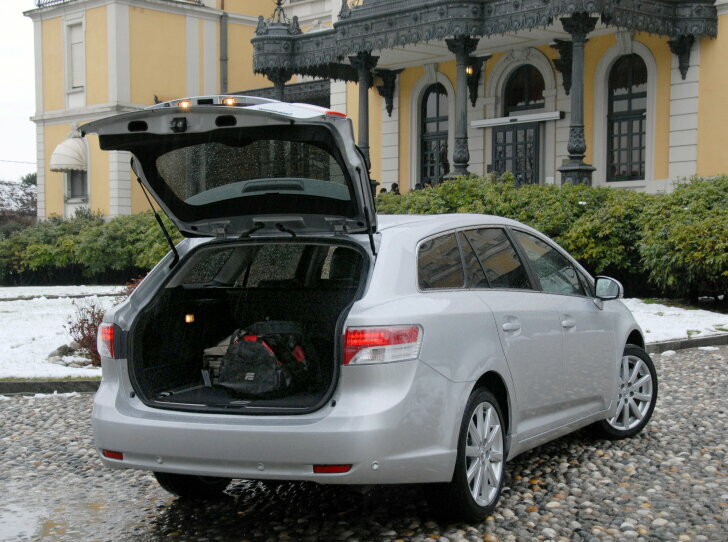 The boot can easily be reached via a large rear door which opens wide. In one simple move the rear seat can be split and folded in two different parts in order to enlarge the boot space up to 1,609 litres. It is not necessary to remove or dismantle the headrests or the back seat cushions. The load-bed is long and perfectly flat. In order to make optimal use of the space, Toyota supplies sliding barriers allowing delicate luggage to be separated from larger pieces. Toyota also supplies luggage racks, lash rings and two additional storage compartments underneath the load-bed. Everything is entirely like it should be: the most respectable boy of the class does not slip up. The new Toyota Avensis excels in everything. Its engines are not only powerful, but also remarkably economical (although the promised fuel consumption is hard to achieve). The road-holding is superb and the steering is firm, although the Avensis is definitely not a sporty car due to its enormous weight. As an estate car the Avensis Tourer offers plenty of space and many smart inventions that allow for the space to be optimally used. To some the most respectable boy of the class may just be an annoying little fellow as he constantly gets all the credit and gives others no chance. But as far as the executive market is concerned it is a true delight to welcome such a genius and the new Toyota Avensis is just that! The Corolla is dead, Long live the Auris!